Toddlers’ Workshop is a child development programme for toddlers (age 20 months – 4 years). It offers a weekly session of 90 minutes which is attended by both mother, father, granny or nanny and child. Workshop owners and leaders hold a Certificate and/or Diploma in Family and Child Development. They are available to answer mother’s queries and to assist them if necessary. The aim of Toddlers’ Workshop is to establish in the toddler an independent work style which is at the same time orderly. By providing the toddler with opportunities to work with a variety of interesting apparatus, his curiosity is aroused, his mental activity and motor co-ordination are challenged, and his concentration is developed. The presence of the mother is important in that it reduces the child’s anxiety and sets him free to concentrate on his environment. Her presence also facilitates and enhances the child’s learning patterns. Are children of that age not too young to be exposed to formal education? They are – therefore the emphasis is on “following the child.” The mothers must not direct, instruct or teach. Toddlers’ Workshop provides a wonderfully stimulating environment which the toddlers can explore in the safety of their mothers’ presence. Surely it is good for a parent to teach her child various skills? The Toddlers’ Workshop approach is to leave the initiative with the child. The toddlers can choose the equipment they want to work with. They are not ready to learn abstract concepts, but they are given many opportunities to experience their environment concretely. This approach is a sound foundation for pre-school education. It ensures that every child proceeds at his/her own pace. What if my child does not enjoy Toddlers’ Workshop? There could be aspects of the Toddlers’ Workshop programme that a child may not like. However, because of the wide range of equipment and activities, it is likely that a toddler will find at least some aspects of the programme attractive. I do the same sort of thing with my child at home, so what extra benefit can Toddlers’ Workshop offer us? 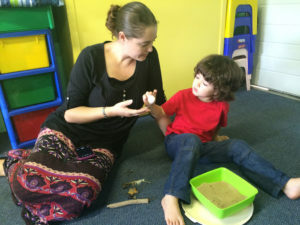 Toddlers’ Workshop has developed out of a need for additional stimulation for a toddler without being separated from the mother, but it is possible that not every family experience this need. WHAT IS TODDLERS’ WORKSHOP DESIGNED TO DO FOR YOU AND YOUR CHILD? Channels child’s energy without complication of separation from mother. Provides environmental stimulation in a prepared, enriched environment. Lays a foundation of order – the way we work enhances child’s feeling of security Logical thinking pattern Self – control. Enriches the mother / child relationship – an opportunity to spend quality time together. Development of motor skills: both fine and gross motor co-ordination. recognition of shapes recognition of similarities recognition of differences co-ordination of visual and motor skills development of auditory perception. Enriches mothers’ repertoire of educational skills and activities at home. Provides a social experience, information and opportunity for discussion for mothers.